Ubisoft 2015 E3 Press Conference Recap! Ubisoft’s press conference is in the books, and it was a surprisingly good one. Kicking things off was the surprise reveal of of a new South Park RPG called South Park: The Fractured But Whole. It is once again being written and voiced by Matt Stone and Trey Parker, and it’s being developed by Ubisoft San Francisco, not Obsidian. Ubi San Francisco’s previous titles are certainly less than stellar, but according to their official site they assisted on development of Stick of Truth. No release window was revealed, but this game will be a superhero game, not a medieval fantasy title like Stick of Truth. Next up, Ubisoft revealed a brand new IP called For Honor. The four vs four multiplayer game will pit two teams against each other in medieval combat as one of three factions. Creative Director Jason Van Denberg took to the stage to speak about the weight that each of the swords will have to them. We got to see a live demo of the game on PS4 and it was honestly spectacular. Those at E3 can play it live right now, and fans can sign up for a beta that will happen…..eventually. No date was given. Next up, we got our first look at an expansion for The Crew called Wild Run. It features bigger cars like monster trucks and sleeker ones like motorcycles. This expansion will launch on November 17th, 2015. We next got a look at a new expansion for Trials Fusion called Awesome Level Max. It comes with a “unique unicorn-riding cat” as well as “30 all-new tracks plus 10 Supercross tracks, 30 unexpected and various challenges to complete, unicorn bike & cat rider, 5 new garage items and more than 130 fresh new Editor objects.” It launches on July 14th. Massive Entertainment took the the stage next and revealed a new mode of The Division called The Dark Zone. This will be The Division’s pvp area, where players can either work with or against every person they see. In the demo below, our players try to get some loot by working with friends and some new “friends” they found along the way. Naturally, betrayal happens. Watch it below, and look for The Division on March 8th, 2016. The beta will come first to Xbox One. Ubisoft announced a new entry into the long running Anno series that takes it to the moon. It’s called Anno 2205, and it’s coming to PC’s on November 3rd. They also followed this up with info on Just Dance 2016, but honestly I’m going to skip over that. I don’t think most of my readers would find it interesting. Actress Angela Bassett was introduced as the commander of Rainbow Six: Siege’s forces. Ubisoft went on to announce that TerroHunt is back. It is a 1-4 player mode that pits you and friends against incredibly smart A.I. We also got a live demo of the mode, and it looks tense as hell. Look for Rainbow Six: Siege on PS4, Xbox One, and PC on October 13th. Next up, Ubisoft revealed they are bringing their long running Trackmania series to consoles. The developers took to the stage and gave us a live demo running on PS4. It will be called Trackmania Turbo, and no release date has been announced. Assassin’s Creed Syndicate had a very minimal presence at Ubisoft’s E3 press conference. They simply showed a CG trailer for the upcoming title and announced that it was playable at Ubisoft’s booth. They did release a long gameplay demo, which I’ve linked to below. Look for Syndicate on PS4, Xbox One, and PC October 23rd. To close the show, Ubisoft did it’s famous “One more thing” and revealed a new Ghost Recon game called Ghost Recon: Wildlands. It is a four player co-op online game set in a massive open world where players will take on missions to take down drug cartels. The demo focused on the many ways that players can take out their target, either with stealth, open assaults or ambushes. No release date was announced. And that was Ubisoft’s 2015 E3 press conference. What was your favorite part? Let me know in the comments below! This entry was posted in Gaming and tagged Assassin's Creed, Assassin's Creed Syndicate, For Honor, Ghost Recon Wildlands, Rainbow Six Siege, The Crew, The Division, Ubisoft on June 17, 2015 by leagueofmediocregamers. Ubisoft went on to cite that they have rebuilt many of the systems for Assassin’s Creed Unity, “Sometimes to improve the experience. Sometimes to improve the gameplay itself. Sometimes to reskin it, to make it look fresh all over again. Or sometimes because we had to make everything online-compatible.” Assassin’s Creed Unity will face stiff competition on it’s new release date. Releasing that day as well are Halo: The Master Chief Collection, LEGO Batman 3, another Assassin’s Creed game, Rouge, and another Ubisoft title, The Crew. It is preceded the week before by Call of Duty: Advanced Warfare, and launches one week before yet another Ubisoft title, Far Cry 4. This reporter’s opinion: This is a major blow to Ubisoft. Releasing Assassin’s Creed before Call of Duty was always a major plus for the company, and now releasing the same day as another one of their own games could prove disastrous. On top of that, Far Cry 4 releasing just the next week could present problems of it’s own. I have almost no doubt, one of those three titles will be pushed back to 2015. My guess? The Crew. There is next to no hype about that game right now, and launching it the week after Call of Duty could be a death blow for the new IP. I could be entirely wrong, but I still foresee quite a few shakeups in the Fall release schedule. This entry was posted in Gaming and tagged Assassin's Creed, Assassin's Creed: Unity, delay, Ubisoft, Unity on August 29, 2014 by leagueofmediocregamers. Here’s your first look at Assassin Creed: Rouge’s gameplay, with eight minutes in the Artic and nine minutes in the River Valley! Assassin’s Creed Rouge stormed into Gamescom this year with over fifteen minutes of gameplay. In the first gameplay, we find Assassin Hunter Shay Patrick Cormac as he traverses the dangerous waters of the Artic. Cormac will be a combatant in the Seven Years War between the British and French, where he will aid the British by completing various tasks like sinking French ships, capturing French forts, and freeing British prisoners of war. We get a peek at the game’s improved naval combat, which put a larger emphasis on the ram for both battle and exploration. The ram will be used to destroy ice in your way as you travel, or crush an enemies ship. In the second walkthrough, we find Cormac in a new area called the River Valley. Here, we get another brief run through on the game’s naval combat, but the majority of the time capturing an Assassin fort. The fort is ran by a full fledged Assassin, and these men prove to be your greatest opponent yet. The Assassin can use all of the tactics you learned in the last few games to flee from you or kill you. This includes air assassinations, smoke bombs, shooting explosive barrels, and a litany of other tactics to slow your advance. Take a look. Assassin’s Creed: Rouge launches on November 11th, exclusively on Xbox 360 and PS3. This entry was posted in Gaming and tagged Rouge, Ubisoft on August 13, 2014 by leagueofmediocregamers. Assassin’s Creed: Rouge announced, coming to the PS3 and Xbox 360 this November! Assassin’s Creed fans on last-gen consoles, rejoice! Ubisoft has announced an all new Assassin’s Creed game that is coming exclusively to the Xbox 360 and PS3 (sorry Wii U owners). The game follows Shay Patrick Cormac, a former Assassin, in a tale of revenge as he hunts down those who he once called brothers as a member of the Templars. Set during the Seven Year’s war, which served as a precursor to the French Revolution, the setting of this year’s other Assassin’s Creed title, Unity. The Seven Years war took place in Canada, The West Indies, and West Africa, and this new title will follow the war in Canada. Rouge will feature the series’ now iconic ship battles, as players will sail the North Atlantic in a ship called the Morrigan, as well as exploring New York and the Appalachian River Valley. Rouge is being developed Ubisoft Sofia, along with studios in Singapore, Montreal, Québec, Chengdu, Milan, and Bucharest. More information on Rouge will be available in this month’s issue of Gameinformer, along with new information on Unity. Look for Rouge on PS3 and Xbox 360 on November 11th of this year. This entry was posted in Gaming and tagged Assassin's Creed, Assassin's Creed: Rouge, Assassin's Creed: Unity, Rouge, Ubisoft on August 5, 2014 by leagueofmediocregamers. Today on Facebook, Ubisoft unveiled our first look at the protagonist of Far Cry 4. 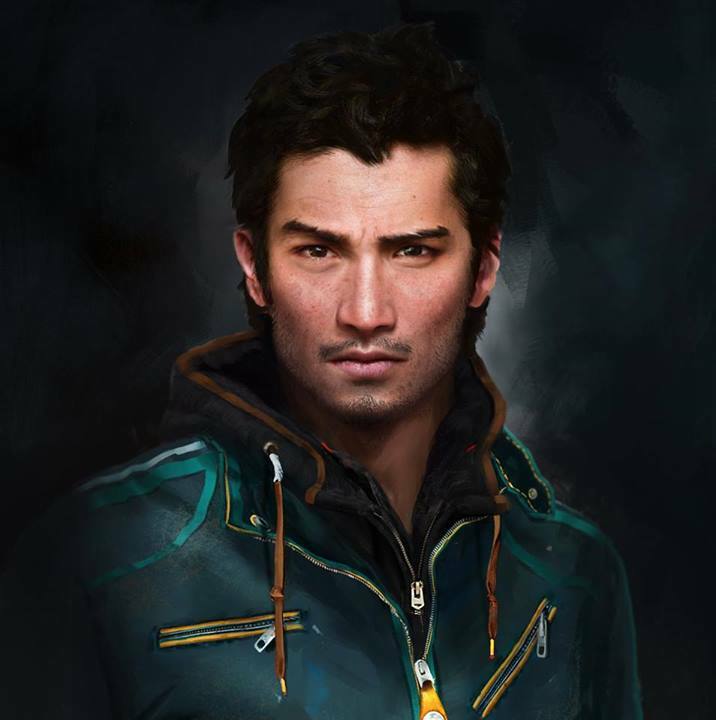 His name is Ajay Ghale, “Kyrati native, devoted son, and Pagan Min’s guest of honor.” Ghale was born in Kryat, but later moved with his mother. He returns to Kryat to fulfill his mother’s dying wish: to spread her ashes in her native homeland. Naturally, this plan goes awry for some reason due to Kryat’s new dictator: Pagan Min. For my on Far Cry 4, check out the reveal trailer during Ubisoft’s E3 press conference, and Sony’s E3 presser. You can also give the game’s intial reveal a look, as it tells you all about the Huk’s Revenge DLC. Far Cry 4 releases on November 18 on PC, PS4, Xbox One, PS4, PS3 and Xbox 360. This entry was posted in Gaming and tagged Far Cry 4, Ubisoft on June 19, 2014 by leagueofmediocregamers. Ubisoft brought plenty of games to E3 this year, as well as a final trademark surprise game. Ubisoft opened the show with the first five minutes of Far Cry 4. Opening with a journey on a bus, things quickly get out of control as a checkpoint turns into a bloodbath. After the chaos settles momentarily, we are introduced the Far Cry 4’s antagonist, who I swear is voiced by Troy Baker. More will be shown during Sony’s E3 press conference tonight. Just Dance 2015 took to the stage next, detailing this year’s entry in the juggernaut dance franchise. This year’s Just Dance will introduce group choreography, community remixes, and a companion app that lets people use their phone as a controller. It can play with really any amount of people, from a party to an entire concert. The Division was shown for the second time today, with Ubisoft revealing a truly gut wrenching trailer that showcased how the disaster began. Peter Mannerfelt told the viewers that your team’s job was to discover the conspiracy behind the pandemic. “Someone has to put it all back together” our hero says in the trailer, and you can do that in 2015. Ubisoft next showed off The Crew, it’s open world racing game. Creative Director Julien Gerity showed off a trailer for one of the game’s two hour plus races from Miami to Los Angeles. It has four different demos playable at E3, with an open beta coming this July 23rd. The game will launch on PS4, Xbox One, and PC on November 11th of this year. 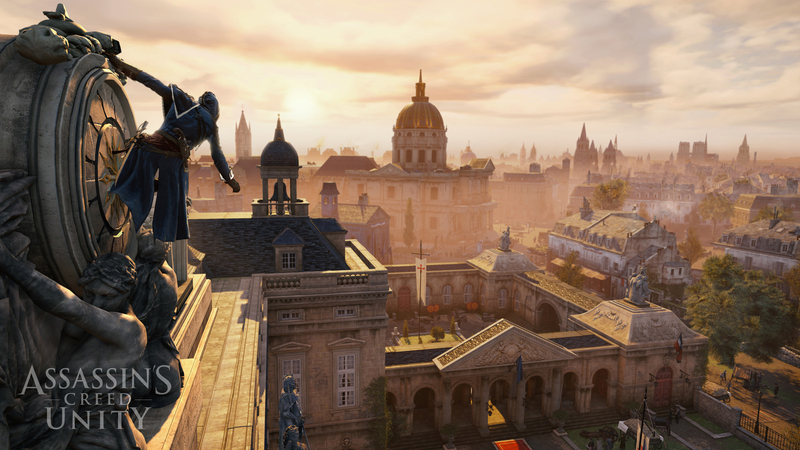 Next up, we got our second look at Assassin’s Creed Unity today with two new bits of media. The first was an impressive CG trailer, that honest to goodness gave my chills. The second was a seven minute look at Unity’s open world. It showed off a classic Assassin’s Creed mission, but a mission that intersected with three other potential missions for you to join in. Fitness games are coming back, with Ubisoft’s Shape Up. This game looks to turn your workout into a game, with crazy new workouts in the vein of DDR and gameplay that looks like you’re completing a quest or playing a game. It was followed by a heart-wrenching look at Ubisoft’s new downloadable title, Valiant Hearts. It honestly had me tearing up a bit. The show closed with Yves Guillemont once again introducing a final exciting title: Rainbow Six: Seige. The pre-alpha gameplay footage shown below showcases a five v five multiplayer match. It was a hostage rescue mission, from the POV of the police. The gameplay showed off destructible environment, perma-death, and different potential ways for the cops to assault the building. No release date or window was given. What did you think of Ubisoft’s Presser? Which of the three has impressed you the most so far? Let me know in the comments below! This entry was posted in Gaming and tagged Assassin's Creed: Unity, E3 2014, Far Cry 4, Just Dance, Rainbow Six, The Division, Ubisoft, Valiant Hearts on June 9, 2014 by leagueofmediocregamers.